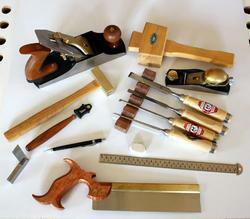 We are dealing in Woodworking Hand Tools. We have the best quality of product of this category. We use the best raw material so as to manufacture these product. These products are very cost effective as well. Scratch Awl is used as a Center Punch Point tempered to 50° RC. The Wooden Scratch AWL is used to make any kind of marking & layout on wood. It has a 3" long rose wood handle with two flats. The high carbon steel blade dose not dull quickly & is hardened to very high RC. A Steel Files (tool) is a Off-hand tools products for filing and stroking applications in Metal and Wood. The Hand Steel Files available in Flat Shaped, Half Round Shaped, Round Shaped, Square Shaped, Triangular Shaped, Three Square Shaped in Rough Cut, 2nd Cut and Smooth Cut. It is available in Inch and Millimeter Size of Scale.